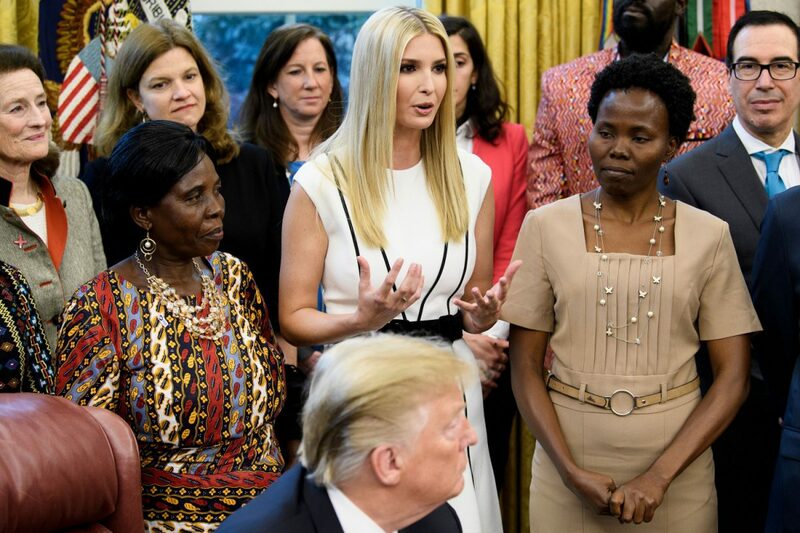 ADDIS ABABA, Ethiopia—President Donald Trump’s daughter and senior adviser, Ivanka Trump, toured businesses run by women in Ethiopia on Sunday, April 14, while promoting a White House global economic program for women. 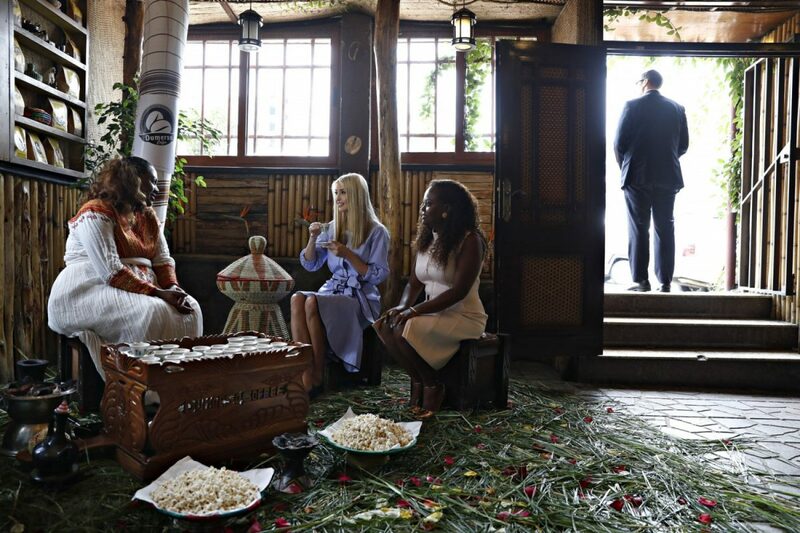 Ivanka first stop in was a coffee shop and textile company in Addis Ababa as part of a four-day trip to Ethiopia and the Ivory Coast on behalf of a White House project intended to boost 50 million women in developing countries by 2025. Aiming to offer assistance and learn about the struggles of women in business, she took part in a traditional coffee ceremony, visited with weavers, and announced new financial support opportunities for local businesses. “Investing in women is smart development policy and it’s smart business,” Ivanka said, sitting in Dumerso Coffee, a dimly lighted space with a woven ceiling, tile floor and colorful paintings. Alongside were women who work in the industry. “It’s also in our security interest, because women, when we’re empowered, foster peace and stability,” she said. Ivanka then visited the textile and craft manufacturer Muya, where she was greeted by dancers and chatted with women seated at colorful looms. She took a seat at one herself. She also noted that Ethiopia has Africa’s second-highest population. Ivanka was accompanied by Mark Green, administrator of the U.S. Agency for International Development, and David Bohigian, the acting president of the Overseas Private Investment Corp. (OPIC), which provides loans, loan guarantees, and political risk insurance, funding projects that stretch across continents and industries. The OPIC and Ivanka Trump announced the White House program last year. She has drawn praise for taking on the project geared at women. At the coffee shop, Ivanka and her team announced a loan, issued by a local women-focused bank and backed by USAID, for a coffee business owned by women. At Muya, the team announced additional OPIC financing for the region. In the next few days, she plans to meet with Ethiopian President Sahle-Work Zewde and Prime Minister Abiy Ahmed. Then in Ivory Coast, she will visit a cocoa farm and participate in a meeting on economic opportunities for women in West Africa. That gathering is part of the World Bank’s Women Entrepreneurs Finance Initiative, a program that Ivanka Trump pushed the bank to introduce. 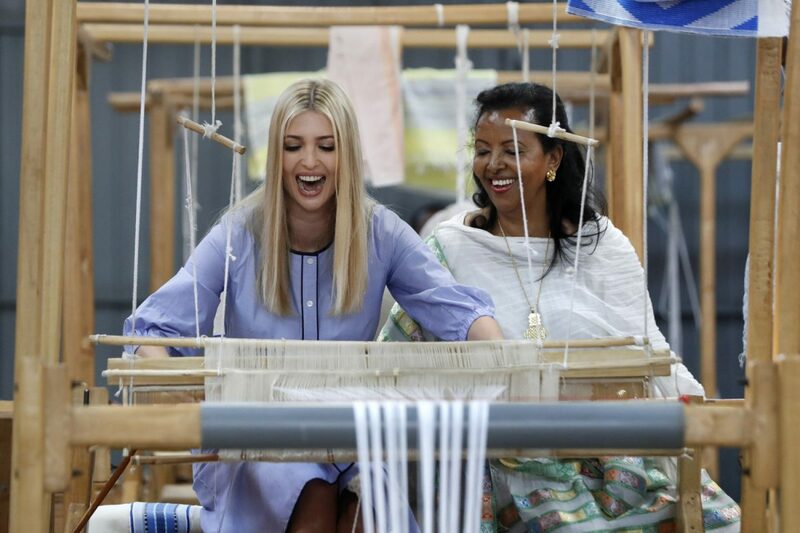 White House senior adviser Ivanka Trump (L) tries her hand at a traditional weaving loom in Addis Ababa, Ethiopia, on April 14, 2019. (Jacquelyn Martin/AP Photo)The new global women’s initiative involves the U.S. State Department, the U.S. National Security Council, and other American agencies. It aims to assist women in developing countries with job training, financial support, and legal or regulatory reforms. Money for the effort will come through USAID, which initially set up a $50 million fund using dollars already budgeted. The president’s 2020 budget proposal requests an additional $100 million for the initiative, which will also be supported by programs across the government, as well as private investment.